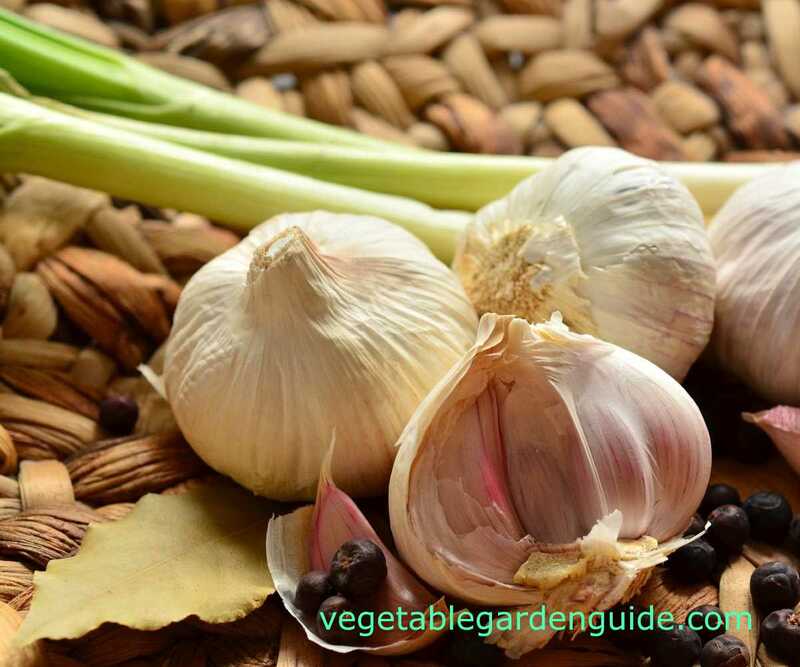 Learn how to grow garlic that is juicier and tastier - discover hidden health benefits of this plant for yourself and your family. The garlic plant is strictly a herb but I have included it here because of its popularity and its growing acceptance as a medicinal plant. Verifiable studies have shown that garlic has positive affects on women during pregnancy; has impacted rapidly on high cholesterol sufferers; is high in antioxidant. Antioxidant's protect the body against damaging "free radicals" and helps protect against heart disease. I draw the line though at using it for a cure for acne - rubbing it on my face is too risky for my social life. So knowing how to grow garlic has lots going for it - not least for its cooking qualities. Garlic has been used as a food for thousands of years. It was traditionally used to add flavour to food. It is sold fresh, as a dry powder and as an oil. Garlic is very popular in all types cuisine all over the world. Grow garlic in any well drained soil. Although garlic is not fussy about soil type, better results will be achieved if well rotted compost or manure is dug into the bed prior to planting... along with a top coating of a general fertiliser such as Growmore. Experienced garlic growers have learnt how to grow garlic for best results by making sure it is not grown in ground that is waterlogged or can become waterlogged. The application of compost will help improve the drainage. Garlic plants will be in the ground for a long time and may rot during the winter months if too wet - after all would you like your bottom dipped in cold water all the time brrrrrrrr. Typically... ground prepared for growing onions is ideal. Garlic needs to grow as quickly as possible so try to ensure it is planted in full sun. For best results in the UK... planting garlic in October is definitely recommended for the biggest bulbs. 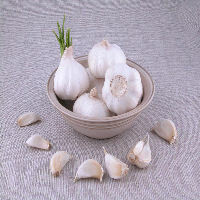 The planted garlic cloves will benefit from a period cold to cause them to seperate and grow as bunches of cloves. My own choice would be to purchase a known variety that is suitable to our climate and is known for its flavour - after all knowing how to grow garlic is about doing all you can to ensure success. Spanish Roja is the one I choose (see photo on right)... Hardneck (Rocambole) variety: This variety is closest to wild garlic and naturally forms a seed stalk or scape which curls into a characteristic loop. It has its ancestry in northern Europe and is very hardy, so will thrive throughout the UK, and is ideal for more northern areas. Bulb wrapper on the mature bulb is quite thin and may have a brownish cast to it. What it lacks in beauty however is more than made up for in flavour and it is regarded as the finest of all garlic's in this respect. This can be purchased from Dobies Seeds. Whatever you decide they are treated the same when being planted out. The garlic bulb is a cluster of individual sections or cloves, each bulb will contain 10-20 cloves of garlic depending on the variety - these cloves are what you will plant into the ground. Start by dividing the cloves of garlic from the bulb and then setting the largest and healthiest looking cloves apart for planting. Plant the garlic cloves with the pointed end uppermost in late October with the base (root end) set approximately 4cms(1.5") deep. As a rule-of-thumb the pointed end of the garlic clove should be just below the surface of the soil. 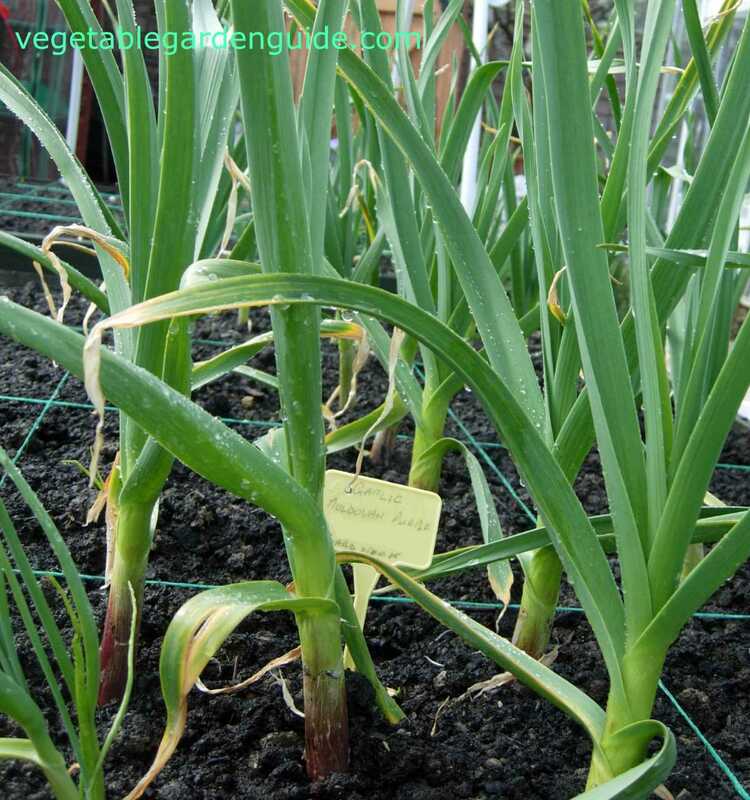 Plant the garlic cloves 10cms(4") apart in their rows and the rows 20cms(8") apart. Thats the planting done so lets see what the seasons work involves... this ones easy. Give your garlic plants a monthly top dressing of a general fertiliser from about May onwards. Water as needed... especially in dry weather; keep the weeds down by hand weeding or - if you use a hoe be careful not to damage the garlic bulbs that are forming. That's it... told you this one's easy. Garlic plants and bulbs are generally very resistant to pests. In fact it is often grown specifically to protect neighbouring plants. All pests that attack onions will affect garlic plants. The most significant pest is likely to be nematodes (eelworms) which attack the roots and bulbs. Inspect bulbs before planting to ensure cloves are nematode-free. Thrips and onion maggot are two other potentially serious pests although both can be effectively controlled by crop rotation. 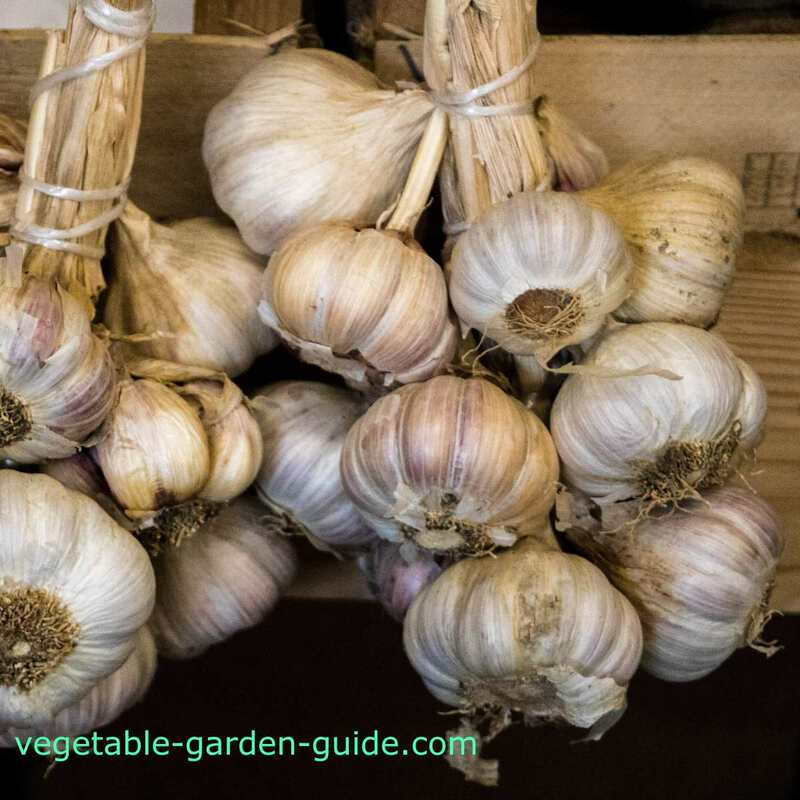 When garlic bulb growth has finished and the plant matures - usually in August, the top leaves will begin to turn brown and yellow and die back. The garlic plant is ready to harvest when approximately half the leaves have died back - always make sure that a handful of green leaves remain to ensure bulb wrappers remain intact after harvesting which gives protection during winter storage. Harvest during dry weather if you can... so that wet soil does not stick to the bulb when lifted. Loosen below the roots with a fork or trowel - be careful to avoid damage - fresh bulbs bruise easily. Lift the plant, shake off loose soil and leave to dry on the surface for a few hours. Garlic at this stage is termed 'fresh market garlic' or 'wet garlic' and has a superb flavour quite different from cured (dried) garlic. When the garlic plants are thoroughly dry place them in a string bag or string them together by intertwining (plait) the dried foliage. Store the garlic by hanging them in a warm, dry place and they should be ok for several months of use. Now that you know how to grow garlic... don't forget to let me know how your acne is going.